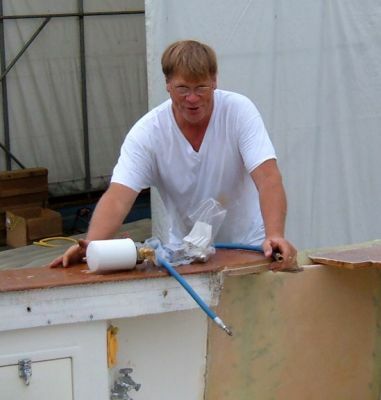 Installing FloScan equipment in the engine room involves lumber and electrical work. 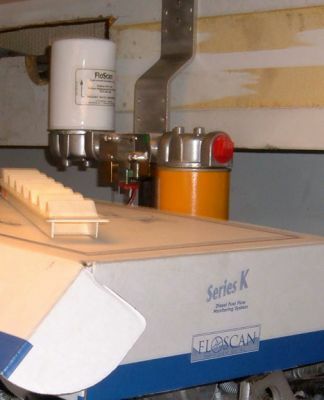 Sponsors For This Project: FloScan Instrument Company, Inc.
Bruce installed the return portion of the FloScan on the inboard side of each motor. With the part in place he made a "dry run" with PVC-type water tube to determine the best route for the fuel line. The result of this exercise gave Bruce the dimensions for the actual fuel lines without any expensive mistakes. The main part of the FloScan was mounted forward and above each motor. Bruce then did the same exercise as for the return to net exact measurments for the actual fuel lines. Note that both return and main have been mounted in areas that give easy access. 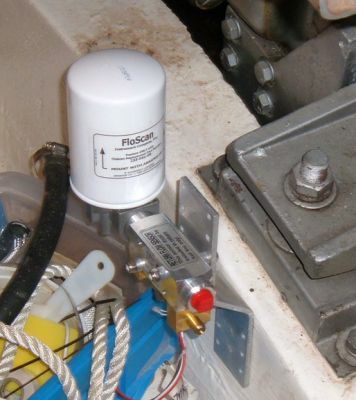 FloScan is an important part of engine monitoring and cruising saftey. Bruce is making the fuel lines to connect the FloScan. These lines are all USCG approved. Bruce knows how the lines should be run and is making a very clean installation. 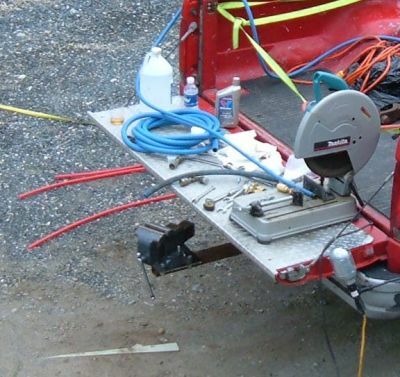 It takes a cut-off saw to cut the fuel line hose. Bruce has the right equipment to install the ends on the lines. The red hose you see in the background are the models for the actual hose he is fabricating.